This beautifully thought out 2 bed, 2 bath townhome offers a little haven of peace on the side of Blackomb mountain. From the private garage to house all your winter and summer gear to the spacious one level floor plan, this 2 bed, 2 bath property is a real gem! Within easy reach of the Village via the free shuttle bus which runs every 10-15 minutes or a 10-15 minute walk. Sleeps 6 people, Ski in/out location. 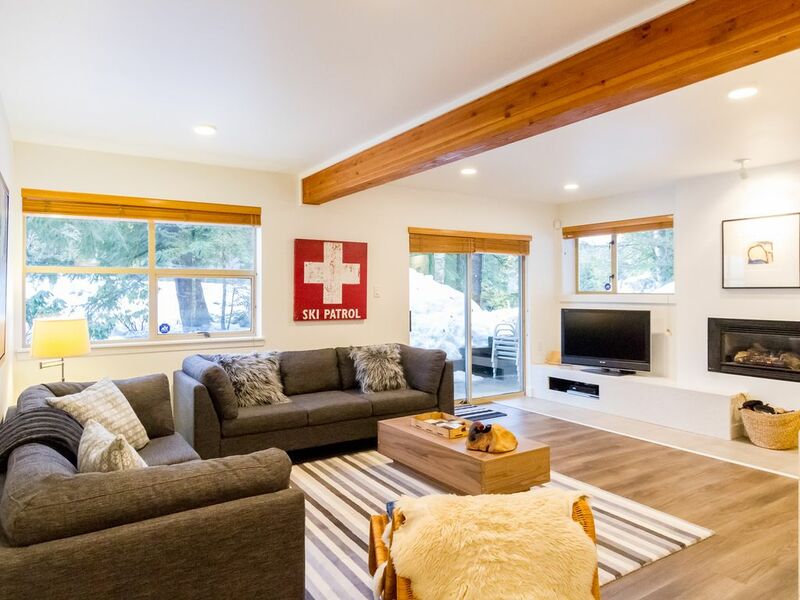 The Forest Trails complex is set in a beautiful and peaceful location on Blackcomb Mountain. During the winter you can ski-in/out (200m walk), or just hop on the FREE shuttle bus. It sleeps 6 comfortably in 2 bedrooms. I would have to say simply that WE LOVED IT! The condo itself was clean, updated and comfortable, especially the bed in the master bedroom! We had three adults and one teenager on this trip and had more than enough room. Having a garage and undercover parking was great as it made it really easy for our skis and snowboards. Additionally, it's location made it really easy to get around. I would definitely recommend this property. Great place to spend a week in Whistler with four friends. Very spacious, with a garage and mudroom to store your gear. Ski out access is a short walk across Spearhead to Blackcomb trail which leads to the new 10 person Gondola. Skiing back on that trail is a bit of a pain since its uphill. We preferred taking the Marquise trail off Cruiser/Merlin, then walking down Spearhead. We enjoyed the onsite BBQ; there is nothing quite like perfect ski conditions on top and grilling burgers in warm weather down in the valley after a long day. The furniture and decor deserve special mention as they are top notch, rather than an afterthought like many other rentals. We got there around 8pm so we were very tired and wanted to rest a little on the bed but we found some hair and red marks (blood?) on the sheet of the master bdrm and the bottom bed of the bunk bed so we had to wash the sheets and pillow cases. We don't think they were washed and we felt grossed out. It took forever to wash them too with the little washer/dryer. The top bunk bed is very shaky and there were white crumbs all over the sheet. My 8 year old daughter didn't feel comfortable sleeping on it so she slept with me in the master bdrm and my husband slept on the couch. My teenage son didn't want to sleep on the bottom bunk bed because there was a big (pee?) stain on the bed cover(under the sheet) so he also slept on the couch. Rather than that the unit is pretty nice with full kitchen. They even provided a lot of different seasoning for cooking, salt, pepper and sugar. At the end of the day, I think what we care the most is to have clean sheets/covers and safe beds for our kids especially. We loved the recent updates. Many Whistler condos are old and worn. This place is bright and sleek. We'd stay there again in a heartbeat. It's built into the hillside, ground level on one side. The garage is above, up the outdoor stairs and not connected to the unit. The lighting is very good, the gas fireplace and baseboard heat work well, and the kitchen is well stocked, including the most varied spice rack we've ever seen in a WhistlerBlackcomb condo, including good quality olive oil! Nice looking flat screen TVs that we didn't use. Comfortable bedding. Logistically it works great - close parking for two cars under cover without having to use the garage, easy access to the free shuttle, and ski storage in the garage. The only thing we wished was provided were instructions on how to ski back to the unit. Skiing to the lifts was easy to figure out, but getting back was unclear. Skiing out entails a short walk up Spearhead Drive then a glide, pole, and skate trip along the backside of the Fairmont Chateau. Great location! Fully stocked kitchen. Comfortable beds. Great for families! Can’t wait to come back! Thank you Corey, I'm so pleased you enjoyed the property and thank you for taking the time to post a review. Fantastic location. A short walk to the village. Comfortable, clean and well equipped.